Any civilization can be judged on how it treats its disadvantaged and sick. Toronto has quietly been beavering away to ensure the disabled can have unfettered access in public buildings. Automatic door openers for handicapped access will take this concept even further. Today the technology is available to many doors that only 10 years ago were unsuitable. The most common example of automated door openers can be found in high traffic commercial buildings such as shopping centres. The commercial sector must by law make their building “disabled friendly” but what do you do is the building is heritage listed ? What if the building construction is of the type that makes it tricky to install a standard automatic door openers for handicapped access? Our answer is to install a after market door opener. Best Brothers Group have a large range of automatic door openers for handicapped access. Free ingress or egress is freely available to the disabled once these are professionally installed. Most of the automatic door openers we install are in domestic dwellings. However we have seen a marked increase in the demand for commercial auto door openers in Toronto. They are being fitted to Washroom doors and even entry doors in smaller shops and businesses. We can also incorporate access control readers as well. This will allow remote opening switches which allow the door to be opened from the security control room. All the auto door closers we install have a neutral function. In the event the power is interrupted the closer will go into passive mode. This ensures the door can still function and keep the door closed until the power is resumed. With over 15 years in the security industry BBG are well provided and implement door closing and door opening devices in Toronto. All equipment and work we supply is covered either by the manufacturers warranty. Should you need use of our emergency after hours service we have a roster system in place which ensures there is a tech always available to help. 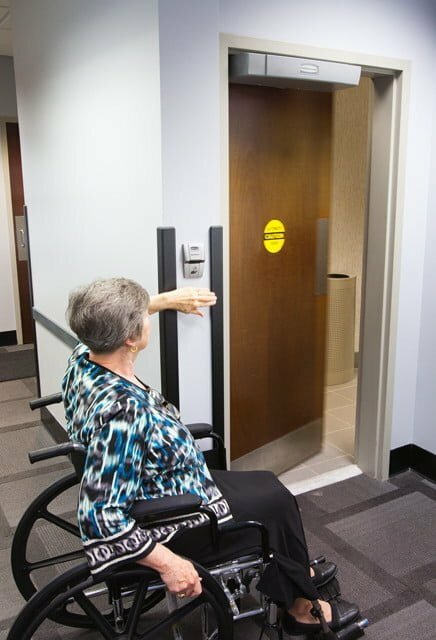 Accessible automatic washroom doors operator are available at many Ontario restaurants, pubs, shopping areas, hotels, museums and attractions.